With the Christmas season upon us once again we can be with our loved ones, celebrate our faith and reflect on our lives together as a community. Of all the joys of the season, perhaps none is more satisfying than the joy of giving. Not just the gifts exchanged between family and friends, but the gifts of time, money and effort many give to people in need and to developing a community that will serve the needs of our young people, our families and our elderly members for generations to come. Please join me and support our community by giving generously to the Congress during this holiday season. UCC continues to be a champion for human rights and civil society in Ukraine as well as to give strength to the people of Ukraine as they build a better country for themselves in the face of external aggression. In light of the ongoing struggle for freedom and democracy in Ukraine, I am most proud of the excellent work UCC has accomplished in terms of coordinating Canadian assistance to Ukraine from the community and our governments. At the same time we have not forgotten about key issues for our community here at home like Ukrainian education, historical memory of the Holodomor, culture, community development, and attracting youth and new Canadians to our community. On behalf of the UCC Board of Directors and my family, Adrianna, Roman, Danylo, Larysa, Olena and myself I wish you all a Merry Christmas and best wishes for a healthy and happy new year. Знову до нас приходить Різдво, ця прекрасна пора року. Ми можемо розслабитися з нашими близькими, відзначити свято в нашій вірі й подумати над нашим спільним життям у громаді. З усіх радощів святкового сезону ніщо, можливо, не дає більшого задоволення, ніж радість дарування. Йдеться не тільки про обмін подарунками між сім’єю та друзями, але й про подарунок часу, грошей та зусиль, який багато хто з нас робить для людей у скрутному становищі та для розвитку громади, що буде служити потребам нашої молоді, нашим сім’ям і нашим літнім членам не лише для сьогоднішніх, але й для прийдешніх поколінь. Ласкаво прошу вас, приєднатися до мене і підтримайте нашу громаду, зробивши щедру пожертву для Конґресу протягом цього святкового сезону. Конґрес Українців Канади продовжує бути захисником прав людини і громадянського суспільства в Україні, надаючи підтримку людям України в будівництві кращого майбутнього, перед лицем зобнішньої агресії. У світлі триваючої боротьбі за свободу і демократію в Україні більш за все, я пишаюся відмінною роботою Конґресу щодо координації канадської допомоги Україні з бокугромади і наших урядів. Водночас, ми не забули про важні домашні питання для нашоїгромадитакі як українська освіта, історична пам’ять Голодомору, культура, громадський розвиток, а також залучення молоді та нових канадців до нашої спільноти. Від імені ради директорів Конґресу і моєї сімї Адріянни, Романa, Данилa, Лариси, Олени та від себе особисто я бажаю вам всім веселого Різдва з найкращими побажаннями здорового і щасливого нового року. З нагоди цього радісного свята Різдва Христового, від імені Конґресу Українців Канади та усіх наших складових організацій вітаю ієрархів українських церков, проводи та членство українських організацій, а також всіх наших добровольців, працівників, жертводавців і симпатиків, та бажаю кожному українцеві та всім людям доброї волі веселих і радісних свят, щастя, міцного здоров’я, великих успіхів, і Божого благословення у новому році. The Council of Ukrainian Credit Unions of Canada (CUCUC) held its Annual General Meeting on November 8, 2014. Greetings were read by the President of the World Congress of Ukrainians, Evhen Czolij and the President of the Ukrainian Canadian Congress, Paul Grod. MPs Ted Opitz and Wladyslaw Lizon took part in a round table discussion regarding proposed changes to Canadian laws that will impact Credit Unions.They promised to bring the concerns and cautions of the Council to the government. Delegates of the meeting listened to the reports outlining the work completed during the year, and unanimously expressed their trust in the President, Olya Sheweli to continue the work of the Council. 8-го листопада 2014, відбулися Річні Загальні Збори Української Кооперативної Ради Канади (УКРК). Привіти склали голова Світового Конґресу, Евген Чолій, голова Конґресу Українців Канади, Павло Ґрод. Посли до канадського уряду, Тед Опиц та Владислав Лізон взяли участь у дискусії-Круглому Столі у справі намічених змін канадских правелякій вплинуть на працю кредитових спілок, та обіцяли представити урядові затурбовання та застереження УКРК. Присутній делегати, переслухали звіти про працю Ради у минулому році, та одноголосно висловили довірр’я на дальше продовження працею Ради голові Олі Шевель. 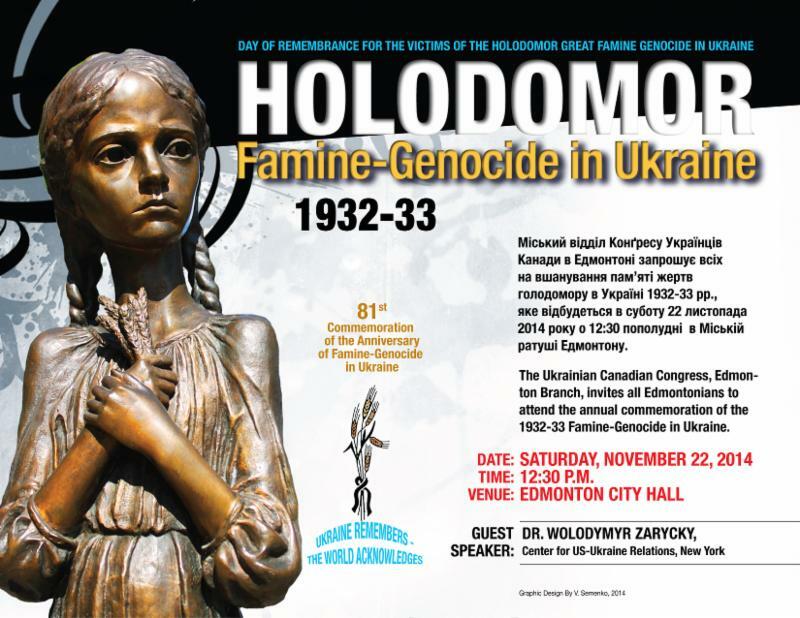 During the week of November 17th-22nd, the Ukrainian Canadian Community held commemoration events to remember the Holodomor and recognize this heinous crime as an act of Genocide. In addition to the ceremony held in Ottawa on Parliament Hill, the following are events that took place from coast to coast. 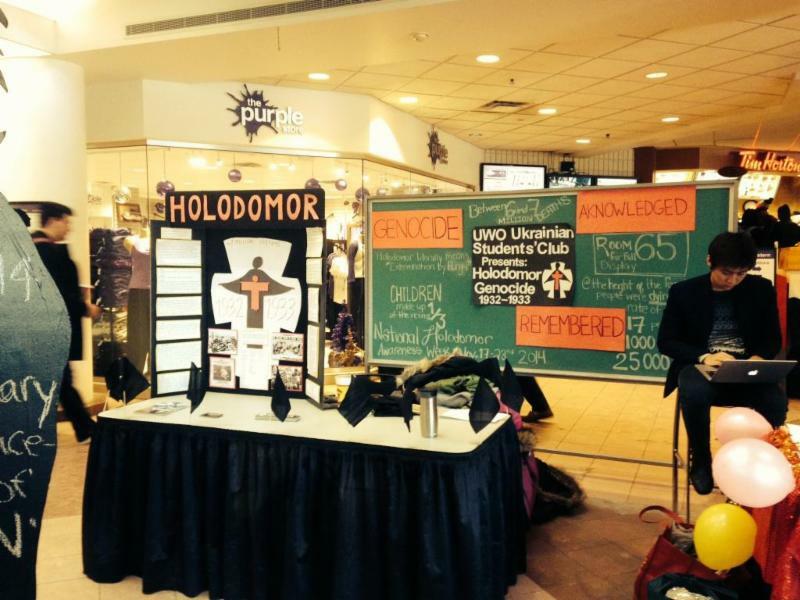 Edmonton – The UCC Edmonton Branch held an annual commemoration ceremony at City Hall on November 22, 2014. 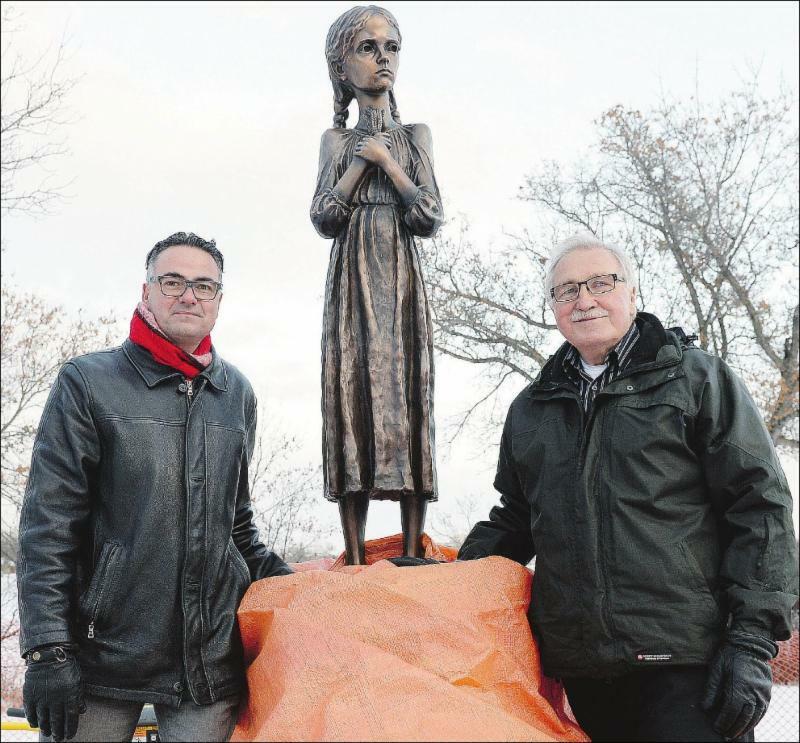 The UCC Regina Branch unveiled the Holodomor statue entitled, “Bitter Memories of Childhood”, a replica of the original statue in Kyiv. It is located near the Saskatchewan Legislative building in Wascana Park. 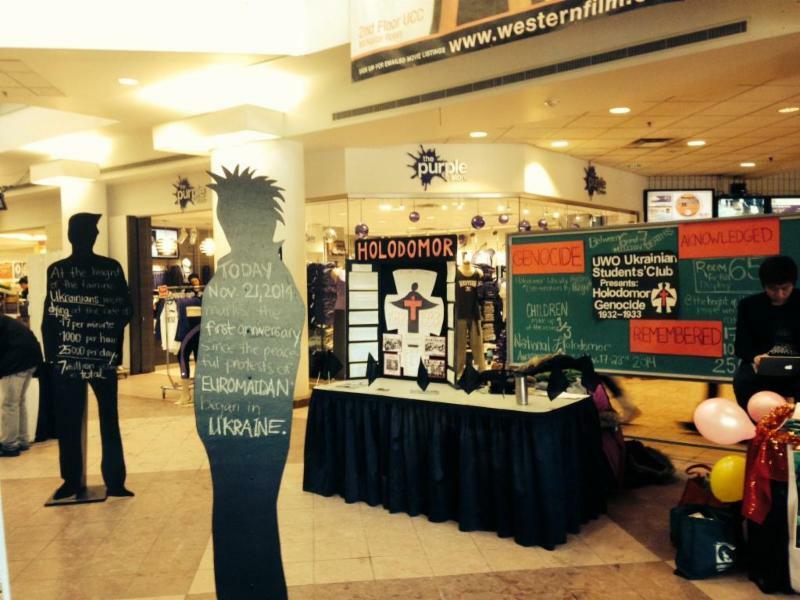 The University of Western Ontario Ukrainian Students’ Association set up a display on campus for Holodomor Awareness Week, as part of SUSK Holodomor activities. 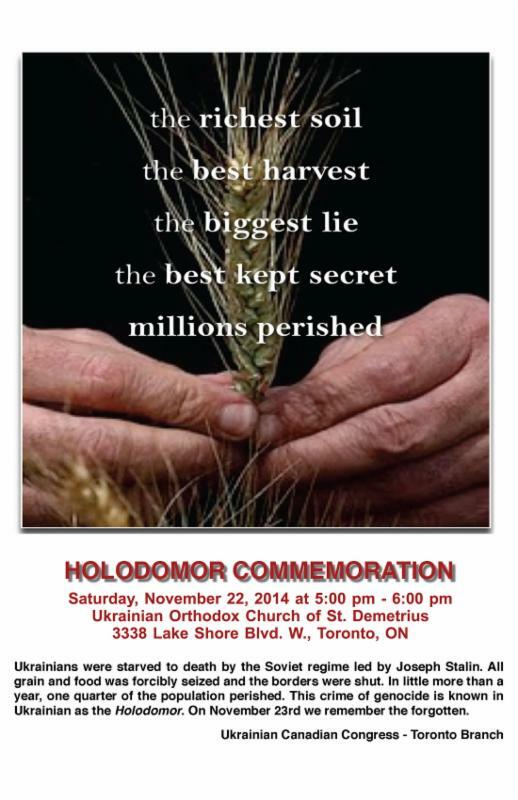 Toronto – The UCC Toronto Branch held a commemoration service the Ukrainian Orthodox Church of St. Demetrius on November 22, 2014. 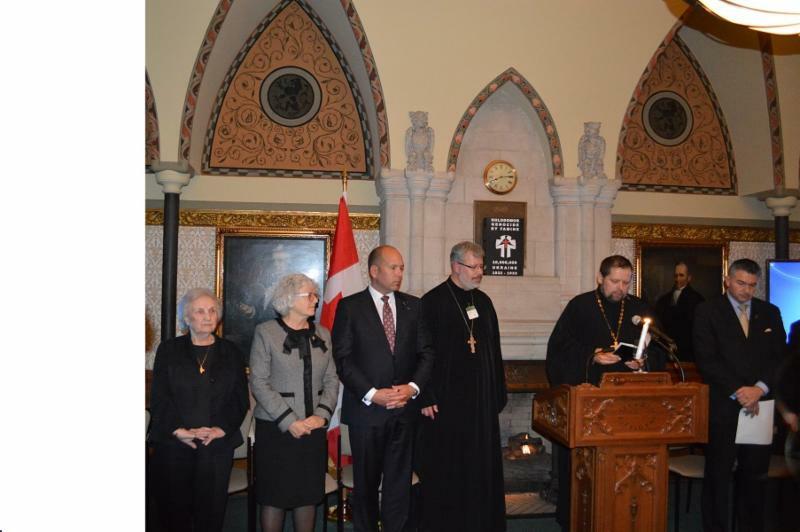 Ottawa – On Wednesday November 19th, in participation of National Holodomor Awareness Week, the Ukrainian Canadian Congress (UCC) in cooperation with the Canada-Ukraine Parliamentary Friendship Group (CUPFG) and the Embassy of Ukraine in Canada held a solemn commemoration in honour of the eighty-first anniversary of the Holodomor of 1932-33 on Parliament Hill. Оттава – У середу, 19 листопада, у участі Всеканадського тиждня визнання Голодомору, Конґрес Українців Канади (КУК) у співпраці з Канадсько-Українською Парламентською Групою Дружби (КУПГД) та Посольством України в Канаді провели урочисте відзначення на Парламентському пагорбі з нагоди вісімдесять першого роковини Голодомору в Україні 1932-33 рр. Please visit our website www.ucc.ca for more information and pictures on the event. November 21, 2014 – On Friday November 21, 2014, the UCC commemorated the one-year anniversary of the EuroMaidan. The EuroMaidan was arena in which mass protests were caused due to the government’s decision to suspend the process leading to the signing on an EU-Ukraine Association Agreement in favour of active discussion with the Russian Federation and members of the Customs Union. Demands were made for the immediate resignation of then president Viktor Yanukovych; subsequently this was fulfilled when the threat of armed conflict was voiced,causing Yanukovych to flee the country and parliament officially impeaching him, replacing the government with one that was Pro-European and ordering the release of Yulia Tymoshenko. This travesty resulted in destruction of Independence Square (Maidan Nezalezhnosti) as well as the deaths of over a hundred protesters, posthumously named the Heavenly Hundred. The events of EuroMaidan were followed by the Crimean Crisis which saw the Russian federation annex the Republic of Crimea and subsequently support separatist forces in Eastern Ukraine which have taken control of the Donestk and Luhansk oblasts; an area known as Donbass. In the past few months, with the advocacy and activism shown by Ukrainian Canadians, the Government of Canada has become the forerunner of the Western world in lending support, economic and political, to Ukraine and its struggle to regain control of the Eastern oblasts of Donetsk and Luhansk and establish itself as a free and democratic country. 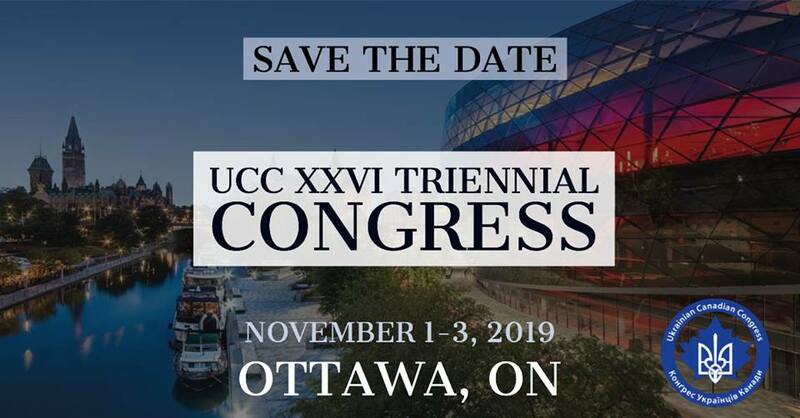 To this day, the UCC continues to work with great fervour to keep the Canadian government informed and active in supporting Ukraine’s independence and working towards repeling the Putin regime from Ukrainian affairs. OTTAWA – On Monday November 24, 2014 former Russian Prime Minister Mikhail Kasyanov visited the University of Ottawa to talk about his life in Russian politics, the state of diplomacy in Putin`s government and the pro-democratic movement within Russia`s borders. Mr. Kasyanov served as the Prime Minister of Russia from 2000-2004. During his time in office he pushed through numerous democratic reforms, liberalized trade and invested in a strong national infrastructure as well as pension programs. Following his departure from office, he has been an opponent of Putin, inside and outside of the government, forming the People’s Democratic Union in 2005, and the Republican Party of People’s Freedom in 2010. Chrystia Freeland Member of Parliament for Toronto Centre began by interviewing Mr. Kasyanov which led into an open question period. To view the entire conversation, click here. On Sunday November 23, – members of the Ukrainian community in Hamilton had the opportunity to meet with local authors, listen to their ideas and buy their works.This initiative was organized by the President of the Ukrainian Canadian Congress Hamilton Branch Nadia Dusanowska and author Marsha Forchuk-Skrypuch,. A tribute to Dr. Petro Potichnyj in recognition of his life’s work, creativity and accomplishments. The commemoration took place at the Ukrainian Cultural Centre in Hamilton. Ms. Skrypuch, an author of over 18 books for which she has received multiple awards and praises, spoke about her beginnings, career path and the varying themes the encompass Ukrainian life both in the diaspora and in Ukraine; from the Holodomor to the struggle for freedom for the Ukrainian people, focusing her attention to young readers. Her most recent work, The Underground Soldier is dedicated to Dr. Potichnyj with whom she had had extensive conversations about the Ukrainian Insurgent Army (UPA) during World War II. 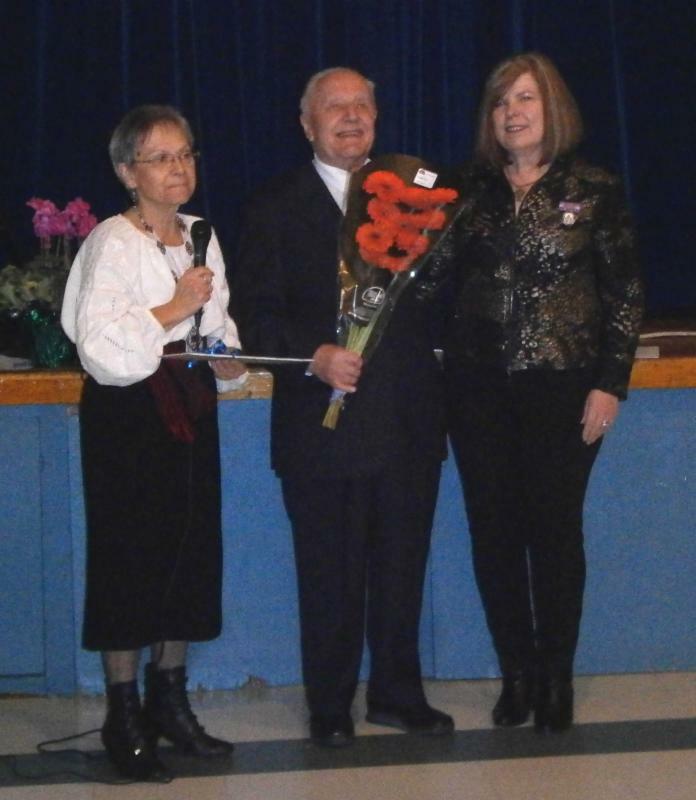 Ms. Dusanowska had the honour of presenting Dr. Petro Potichnyj, Professor Emeritus from McMaster University in Hamilton, author and Editor of the Annals of UPA. Dr. Potichnyj completed his higher education with a B.A. from Temple University and an M.A. and a Ph.D. from Columbia University. 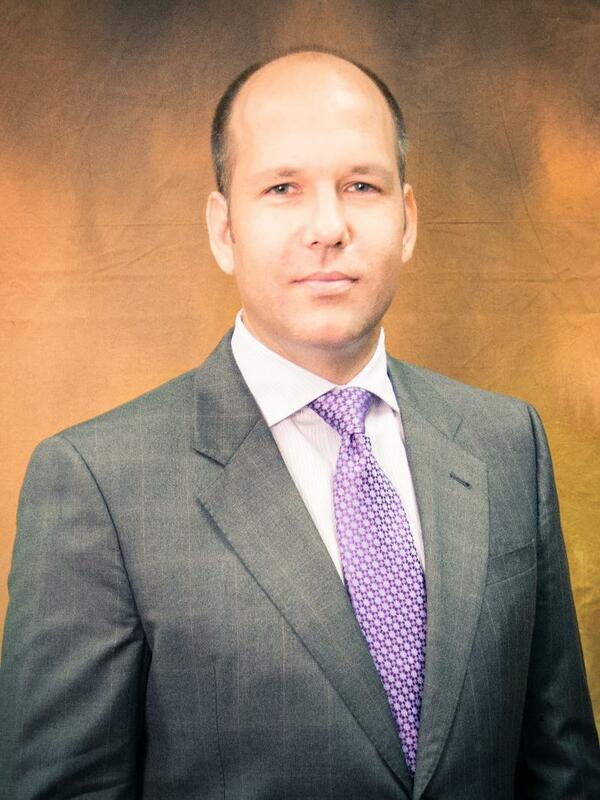 His teaching career, in the area of Political Science, includes positions at Uppsala College, Sir Wilfred Laurier University, the Ukrainian Free University and McMaster University. He served as Dean of Law and Social Sciences at the Ukrainian Free University, as President and Secretary General of the Canadian Association of Slavists, and as Secretary of the International Committee of Soviet and East European Studies. He is a senior fellow of CERES at the University of Toronto; member of the Scholarly Council of the Hrushevsky Institute of Ukrainian Archaeography in Kyiv; and honorary professor of East China University and the Lviv Polytechnic National University. He has written, co-written and edited 35 books and more than 100 scientific articles. He is also the Editor in Chief of the Litopys UPA series of documents and memoirs on the Ukrainian liberation struggle in the twentieth century (80 volumes published to date). In 2008 he was decorated by President Yushchenko of Ukraine with the Order of Merit III Class. His most recent work, My Journey (available in both English and Ukrainian), depicts his various paths in life, from his youth in the Ukrainian Insurgent Army to his years as a university professor. Dr. Potichnyj ‘s immediate family was in attendance, including his brothers, children, grandchildren as well as his beloved wife of 57 years Tamara, with whom the crowd honoured with the singing of Mnohaya Lita (Many Happy Returns) in recognition of their 57th anniversary. A sincere thank you to all who participated in this momentous and meaningful occasion in the history of community. В неділю, 23-го листопада, члени української громади в Гамільтоні мали нагоду зустрітися з місцевими авторами, почути їхні думки та закупити їхні книжки. Ініціятива цеї зустрічі виникла з домовлення між головою місцевого відділу Конґрецу Українців Канади Надією Дусановською та Маршою Форчук-Скрипух – однією з учасниць/авторів – з наміром відзначити життя, творчість і заслуги Др. Петра Потічного – другого автора на цій зустрічі. Імпреза відбулася в приміщеню Українського Культурного Центру в Гамільтоні, разом з гостинним прийняттям вина та смаколиків. В програмі, першою виступила М. Скрипух – автор понад 18 книжок – за які отримала ряд похвальних оцінок та нагород. Вона розказала про свій творчий шлях, про теми що охоплюють різні етапи українського життя в діяспорі чи в Україні, від Голодомору до визвольних змагань, зосереджуючись на молодого читача. Остання її книжка, Underground Soldier, присвячена Петрові Потічному, з котрим вела широкі розмови про Українську Повстанську Армію в час Другої Світової Війни. Дальше, ведуча Н. Дусановська представила Петра Потічного, професора емерита при університеті МакМастер в Гамільтні, автора численних наукових праць, головний редактор Літопису УПА, організатор багатьох важливих конференцій та промотор Українсько-Китайських звязків. Він був професором в різних шкіл, включаючи – Університет Темпел, Університет Вилфред Лорієй, Упсала Коледж та Університет МакМастер. Остання з його книжок, Моя Дорога (видана в англійській та українській мовах), цікаво та відкрито описує його життєвий шлях – від юного Упівця до заслуженого професора – з численними фотознимками. Присутними на зустрічі була близька родина Петра Потічного – його брати, діти і внуки як також його віддана дружина Тамара. Всі присутні вітали др. П. Потічного і йоґо дружину ‘Много Літтям’ з нагоди 57-ліття їхнього подружжя. Сердечна подяка усім котрі прислужилися до цего пам’ятного свята/зустрічі. 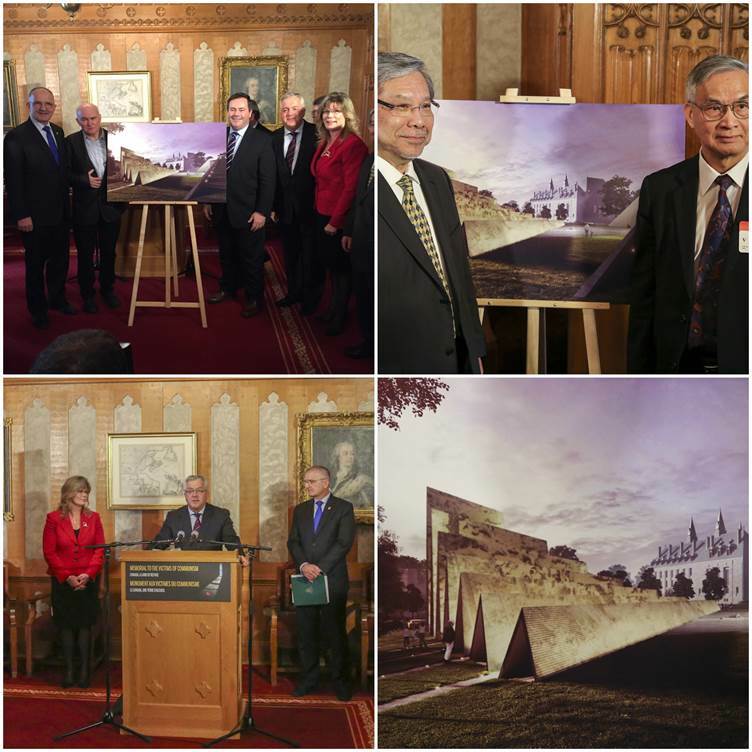 OTTAWA, ON – On December 11th, the federal government unveiled the winning design of the Tribute to Liberty project’s Memorial to Victims of Communism. The memorial is scheduled to be built on Wellington street between Library and Archives Canada and the Supreme Court of Canada. One hundred million fingertip sized “memory” squares will be embedded in a series of ascending folded concrete rows; each row will reach 14.5 metres at its peak. Five million dollars of the six million dollars needed for construction has been raised with the federal government providing three-quarters of the funds. UCC Presidetn Paul Grod is a member of the Board, which has been actively involved in the fundraising efforts of this project. The Honourable Jason Kenney, Minister of Employment and Social Development and Multiculturalism, the Honourable Shelley Glover, Minister of Canadian Heritage and Official Languages and Member of Parliament Wladyslaw Lizon were present at the unveiling. During the holiday season we celebrate St. Nicholas Day on December 19. Traditionally, it is a day where children receive gifts from their parents in secret, in order to believe that they were delivered by St. Nicholas as a reward for their good deeds and behaviour. As a tribute to his life’s work with the less fortunate and needy, December 19 is known as International Day of Aid to the Poor. St. Nicholas dedicated his life to helping those in need, who were less fortunate than him. As we prepare to celebrate the holiday season and St. Nicholas Day, we would like for you to keep in your prayers, all the soldiers and civilians that have fought, died and continue to fight for freedom and democracy in Ukraine; wish for their families to be reunited and for their holidays to be spent together in a joyous and warm environment. In the spirit of giving and in the footsteps of St. Nicholas, we encourage everyone to think of all those in need or less fortunate and donate to or aid them in any way possible. No donation or amount of help is too small or insignificant for those who need it dearly.